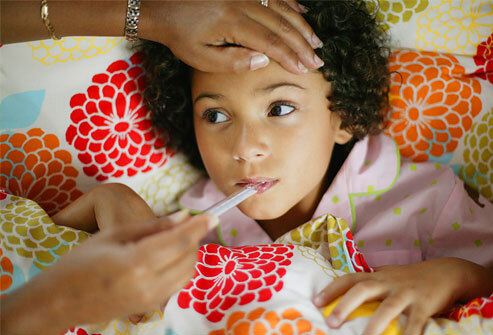 Why do kids have to be fever-free for 24 hours before returning to school? « Howard J. Bennett - Pediatrician and Author in Washington, D.C.
Why do kids have to be fever-free for 24 hours before returning to school? Body temperature varies throughout the day whether you’re sick or healthy. If you take your daughter’s temperature three times a day for a number of days, you will see that the highest readings come in the evening. Similarly, if she is sick, you are more likely to find high temperature at 9pm rather than 9am. This diurnal variation in body temperature causes two problems for parents. First, it’s harder to manage high fevers at night when everyone is trying to get some sleep. Second, if your feverish child wakes up cool, you may think all is well until the fever returns in the afternoon or evening. Although it’s not always clear when a child isn’t contagious, most schools have adopted a 24-hour fever free policy because they know temperatures can come back as the day progresses. That’s why you shouldn’t take your kids to school the morning after a feverish night. This entry was posted in Dr. B's Blog and tagged fever, infectious disease, medication. ← Is baby powder safe?